Imazu, in Nishi-ku, lies on the east coast of the Itoshima Peninsula. Blessed with oceans, mountains and unspoiled landscapes, it is also an important historical area. From ancient times until the Kamakura period, Imazu flourished as a trading port and a hub of multicultural exchange. This prosperous era was followed by the Mongol Invasions (Genko in Japanese), which ravaged the area. The historic sites of Imazu are important cultural properties that cast a light on this period in time. Starting in the 13th century, the tribes of Mongolia succeeded in creating the largest empire in human history, which stretched from the Sea of Japan to Europe. In 1271, Kublai Khan renamed his empire the Yuan, and he sent an expeditionary force to invade Japan in 1274. Unfortunately for him, the invasion was unsuccessful. After this, the Kamakura Shogunate ordered its retainers in Kyushu to build a stone barricade, the Genko Borui, in case of another Mongol invasion. The Genko Borui stretched 20km along Hakata Bay from Kashii to Imazu, but it was built in an amazingly short six months. Given the different methods of construction used along the wall, it is believed that different provinces worked on different sections concurrently. The Genko Borui in Imazu is a 3km section of the entire structure. Excavations were made in 1913 and it has since been partially restored. It is now preserved and maintained as a National Historic Site. Join us as we take a stroll around beautiful Imazu—a place in history. Below we outline an easy walking route so you can discover this beautiful and historically rich area by yourself. 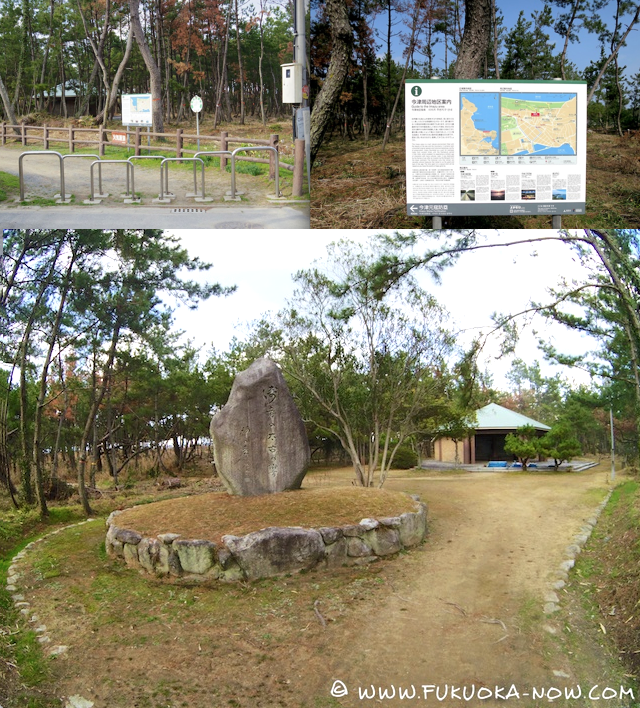 In addition to the 200m excavated ruins, this short hike takes you through the surrounding pine grove – an iconic feature around Japan’s coastline – the beautiful Nagahama swimming beach, and the magnificent panorama from the top of Mt. Bishamon. Take a few hours to enjoy some of Fukuoka’s hidden natural and cultural treasures! 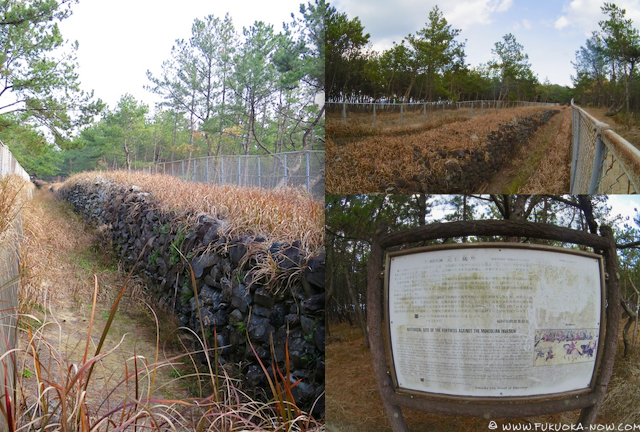 The first half of the hike is a gentle stroll through the Imazu area and the pine grove that runs along the Nagahama coastline and is home to the fortification ruins. This is followed by a climb to the top of nearby Bishamon-yama, which commands a beautiful panorama of the bay, including the area covered earlier in the hike. The return passes through the very old Shofuku Temple and surrounding streets before getting back on the bus. From the bus stop, Bishamon-yama is visible in the distance to the right. Instead, cross the street and head to the left, then take the first right. This path leads straight to the entrance to the fortifications at the edge of the pine grove. 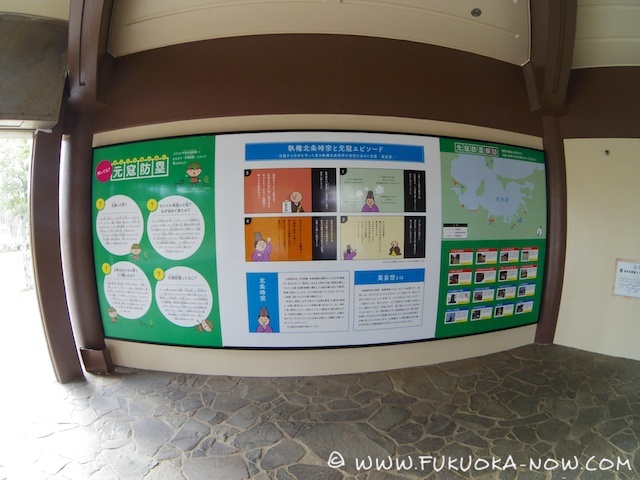 Near the entrance is a panel with a map of the area and multilingual information about some of the sights in the area. Follow the path further into the grove as it leads into the ‘historical area’, with an information hut that provides a greater insight into the site’s significance. While the information panels inside the hut are only in Japanese, the maps and diagrams indicate the positions of the fortifications along Hakata Bay and illustrate the importance of the Imazu area. Fukuoka residents will notice some familiar place names that were also fortification sites. Behind the information hut and stone monument a trail winds its way through the pine trees, leading to the excavated wall. 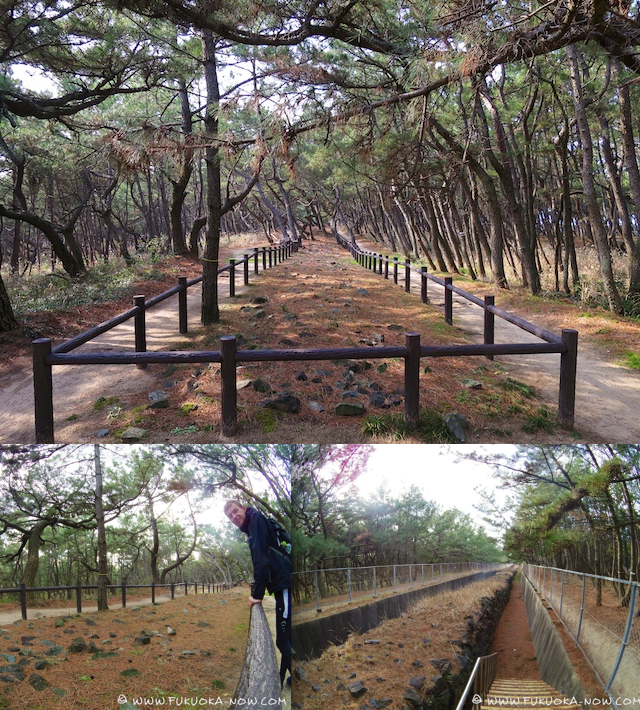 The pine grove itself is also protected so stick to the path as much as possible. Before long the stone fortification comes into view. The first section shows the wall as it was discovered, seemingly just scattered stones amongst the trees. Further on, a 200m section stands excavated and restored. Alongside the wall, information panels in Japanese and English provide and explanation of the historical background. Amidst the pine grove, this site of ancient battles now creates an atmosphere of sheltered peace. Circling back to the start of the fortification, a small path near the monument leads down to the Nagahama beach, with a great view of Hakata Bay and a glimpse of the next destination – Bishamon-yama. Take the path back into the pine grove and return to the information hut. The trail continues on the far side behind the hut. Turn left as it emerges onto a cycle path and follow it around. At the end is another information board and map – to the left is the beach and a parking lot, to the right is the path up to the mountain. The path emerges from the sand and starts to climb gently amongst fields and farm buildings, with Bishamon-yama visable to the left. After a short while take the forking road to the left, where a small park will come into view with a long staircase. To the left of this is the entrance to the mountain trail. Stick to the paved road as it leads all the way to the summit (it’s actually possible to drive almost all the way up). A cleared section about half way up offers great views looking back towards Imazu and the surrounding areas. The last section is a long flight of steps up to the summit, which opens up onto spectacular views of the coastline. Take time enjoy the view but save some space on the camera – Bishamon-yama still has a hidden surprise. A small path behind the shrine leads a little further up for an unbeatable panorama. Head back down the mountain via the same paved road. Just before emerging back onto the main road, take the dirt track to the left and follow it down as it comes out behind the hilltop monuments. The main road is downhill to the right. Turn left onto the road and then left again at the next intersection, where signs point in the direction of the final stop, Shofuku Temple. Shofuku Temple dates back to 1249, some 25 years before the Mongols arrived. The path enters an area adjacent to the main temple, which includes a spot to rest. From there you can walk through to the main courtyard and enjoy the gardens before leaving through the front gate. Once out of the temple grounds, the path leads straight down to the main road between the charming old houses and shops of Imazu. Turn left at the main road and you will see the Imazu (今津) bus stop bound for Imajuku station. • While walking or cycling is the best way to get around the area, those coming by car can make use of the multipurpose parking area, right beside the beach between the stone fortification and Bishamon-yama. •Even though the area is not as remote as other hikes, bring your lunch as there aren’t any cafes or convenience stores. Originally written for Fukuoka Now February 2014. NOTE: The information presented here was gathered and summarized by Fukuoka Now staff. While we have done our best to check for accuracy there is a possible of error and facility details may change. If you notice any errors or changes please contact us. This report was originally written in February of 2014.